Are Barack Obama and Chris Brogan Diminishing the Value of LinkedIn? An interesting point came up in a discussion about LinkedIn the other day, when a friend said that LinkedIn suggested none-other-than President Barack Obama as a “Person You May Know”. 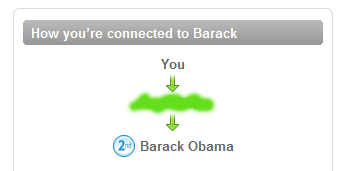 As I’ve written before, I think the suggested connection functionality in LinkedIn needs to be overhauled, but in this case it’s a logical leap since President Obama is already a second degree connection, according to my friend. That prompted me to wonder who my friend knows that knows Obama; perhaps he has a business relationship with someone in the Illinois Congressional Delegation or at some point last year befriended the local campaign chair in our state? Not the case, the shared connection between the sitting President of the United States and my friend was a kid that he had hired a few years ago. I haven’t asked (I’m connected to the person, as well), but I’m pretty sure that this direct connection to President Obama has never met the man. As I’ve written before, I utilize LinkedIn in a very specific way: I must have a real relationship with a person before I’ll connect to them. I define a “real relationship” as being familiar enough with each other that my connections could contact me and I would immediately know who they are (and vice versa). This typically means that we’ve met in person(1) – such as we went to school together, we’ve worked together, talked at a conference and exchanged cards, or are in the same social circles. I want to be able to reach out to my connections to get value out of my network, such as asking them for information and recommendations, or to introduce me to someone else. The latter being a significant part of the value proposition of LinkedIn – that the people you are connected to directly (your first degree connections) are also connected directly to others (your second degree connections) and those others are directly connected to another tier of users (your third degree connections). However, if these networks are skewed by unreal connections at any degree, like those to President Obama, then the value of my network is weakened. It’s not just President Obama, others like social media guru Chris Brogan (who I enjoy following on Twitter @chrisbrogan), send out mass public invitations to gather unreal connections in LinkedIn, such as the one above through Twitter. While the invitation seems innocent enough, he has a tremendous following on Twitter with over 56,000 followers. He includes his e-mail address in the request, which allows these would-be connections to bypass a safeguard that LinkedIn has put in place to encourage real connections in the system. I have over 300 direct connections in LinkedIn and that connects me within three degrees of 1.25 million users. If any significant percentage of Mr. Brogan’s Twitter followers take him up on his offer to connect in LinkedIn it will play havoc in the system. That “havoc” will result in users having to spend more time sorting between real and unreal second and third degree connections and in the long run can only serve to decrease confidence in their network and ultimately the platform. I respect that people use social media tools in different ways and that they evolve over time. In fact, I think that’s what makes Twitter such an amazing platform. However, this is the first instance I’ve found where someone else’s particular use of the tool is diminishing my value. (1)Or, at the very least we’ve had multiple digital interactions (e-mail, phone, etc).